LCA White Out is a champion full Accoyo Inca son. If you really want the best...and we are not talking just off this farm but in all the US, this is it!!! Just look at Chico's fiber result at 15 months of age, 17.9micron with a cv of 19.4%. Judges all year long raved about density and luster. Well this fiber test confirms his fineness! Chico is hands down a stunning male. His fleece is incredibly fine. Denser than anything else he has shown against. It is what we breed for. It displays buttery thick flat independent locking that belies the density tuned in with the fineness. The greasy handle comes from the superior follicle formation and although not tested yet we'll bet he is in the upper realms on follicle density. Test coming. All of this is stacked on a blocky square robust frame. He is built like a brick s...house! Line backer material but with a docile friendly nature along with the urgency to spread his genes!!! Chico's head is to die for and along with all this phenotypic quality what else would we expect from an offspring of the prepotent stud male lines of Pucara Kahuna, Bruxo, Uribe and MacGyver. So naturally he slammed them in the show ring. Beaten at the Futurity by his half brother that we own, Pucara Pipeline, and by a young Kahuna grandson at the Nationals when Chico was starting to get over fleeced. We would not swap for the world. You have here, show record, pedigree, gorgeous phenotype and heritage from the best suri genetics in the US!! A Champion son of the most successful white suri male in the Futurity's history, Pucara Kahuna. 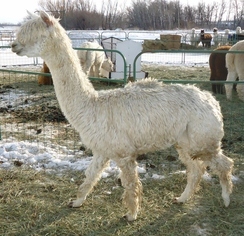 A few years ago when Pucara reserved breedings to Latah Creek's elite males, they sent one of their best Pucara Allegro daughters, Pucara Eve, also the daughter of NGG Geneve who is a daughter of the famous Ganador (who is possible the most unheralded Suri male in the U.S.) to LCA Accoyo Whiteout, a Champion male who they considered a perfect match. Elanora was the result of this pairing. Elanora is an upright girl, pleasing to the eye with an easy gait and correct frame and jaw set. Her fleece shows off good luster, low micron, good independence of lock and way above average density. Combine this with high quality genetics and bred to the best performing male stud in the country and you have a recipe for success. In fact, that is what she has produced, both her 2011 and 2012 cria were exceptional.